How to Work and Homeschool: September 2014 "How to Work and Homeschool" Giveaway! September 2014 "How to Work and Homeschool" Giveaway! Many thanks to the 2000 folks who have signed up to follow the public How to Work and Homeschool ("HWHS") page on Facebook! Having reached two-thousand followers friends over there, it seems like a good time to celebrate with another giveaway of the book. • Leave a comment here on the blog on why you'd like to read the book. • Come say "hi" via a comment on the HWHS Facebook page. • Repin this pin on Pinterest. The winner will be contacted via email the first week of October. Can't wait that long to get a copy? Details on where and how to purchase the book can be found on this page. P.S. HWHS author Pamela Price can be followed here on Facebook, too. 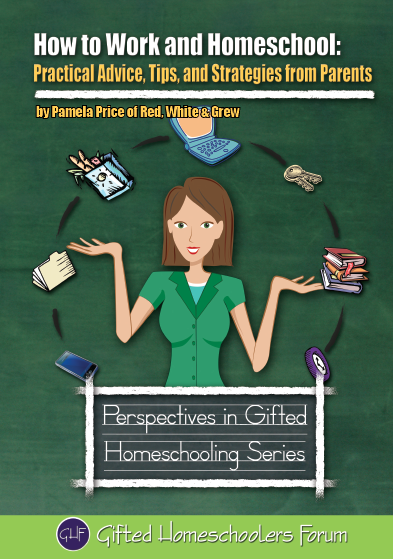 As a mom of 4 going into our 2nd yr of homeschool, I can use all the help and tips I can get! We are in our 4th year of homeschooling and I had to start working a year and a half ago. And, I am still trying figure out a way to do this without losing my mind :) This book would be such a blessing to this mama. I am a single working mama to a four-year-old boy. He has been in daycare since he was 6 weeks old and I've been completely heartbroken over it every single day. He recently asked if I could be his teacher :) I'd really like to take him out of a classroom but have not yet figured it all out. I'd love to have a copy of your book! At the moment I am faced with a difficult decision, which is why I was searching how to work and homeschool and came across your blog! My Kindergartner has become the scapegoat of his class. He has ADHD but is an amazing kid. I began working a month and a half ago and I love it, but I feel like I should stay home with him and homeschool him. I think this may be the best for his now fragile self esteem, but the extra money and "break time" is very nice. I homeschooled my oldest two for several years, I know they would want to be homeschooled again as well. My youngest would then stay home too, How to juggle homeschooling 3 elementary students, a preschooler and work...I need to know?! As a single mom to a 4 year old, I absolutely need to work to sustain us, as I am the sole source of income. I'd love to read your book to help me figure out how to do it all, while maintaining a salary and my sanity!